A chance to see the 2012 film on the big screen. 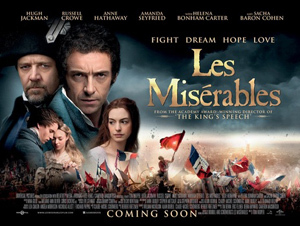 Featuring an Oscar-winning performance by Anne Hathaway and a host of rousing songs. After 19 years as a prisoner, Jean Valjean (Hugh Jackman) is freed by Javert (Russell Crowe), the officer in charge of the prison workforce. Valjean promptly breaks parole but later uses money from stolen silver to reinvent himself as a mayor and factory owner. Javert vows to bring Valjean back to prison. Eight years later, Valjean becomes the guardian of a child named Cosette after her mother’s (Anne Hathaway) death, but Javert’s relentless pursuit means that peace will be a long time coming.